Is there a way to do a light "over dye" to tone down blue and white striped cotton/lycra? What a lovely resource you are! Thank you! Dye up to 15 adult-size T-shirts, with vivid, electric colors that are so colorfast they can be washed with the daily laundry. Ideal for cotton, silk, hemp, and rayon. Contains Procion MX type dye. I scanned through at least 30 pages of the dye group but didn't see anything that really answered my question so I will come to you. I have some yarn dyed cotton lycra--blue and white stripe--and the contrast is a bit much for my coloring. Is there a way to do a light "over dye" (sorry, I don't know the vocabulary for dyeing) to tone it down? If so, what would I use? I think I remember Procion for cotton lycras in general. If I could get to a greyed blue and a light gray stripe, I'd be happy. I know I would test on a sample but otherwise, I'm a complete novice so any help is appreciated. Overdyeing is indeed what you would call that, and it's easy to do. You are correct that Procion MX dye is the best choice for cotton/lycra, because it can be used at room temperature. It's fixed to the cotton with soda ash or washing soda (essentially the same thing). 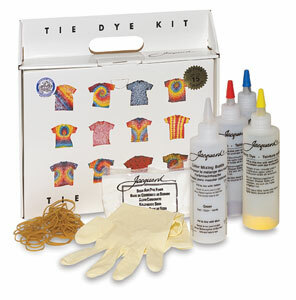 Since Procion dye is a fiber reactive dye, it's very easy to use and doesn't fade the way all-purpose dyes do. In choosing a color for overdyeing, you always have to keep in mind that the existing color will combine with whatever color you choose. If you dye with blue dye, you will end up with stripes of lighter and darker blue, since the original blue will show through. If you dye with red or pink dye, that's the color the white will be, but the blue will turn purple. If you dye with yellow, you'll end up with green and yellow stripes. Your choice of a gray dye should give just the results you're looking for, a grayed blue with a gray stripe. If you want the fabric to be pain solid gray/solid blue stripes, then you will need to do high water ratio immersion dyeing, also known as tub dyeing, bucket dyeing, or washing machine dyeing. See "How can I dye clothing or fabric in the washing machine?". If you use a bucket for dyeing a solid color, you will need to do a lot of stirring, for about an hour. If you would like a more mottled effect, then you can use an even easier method, known as low water immersion dyeing. See "How to Do Low Water Immersion Dyeing". One caveat: gray Procion dyes are mixed from several different colors of dye, which tend to separate out in LWI, so you might end up with a variety of colors. It can be a great effect, but it's not the same as a solid gray. Next question will be where to buy the dye. 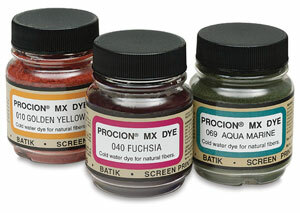 You can usually find a tie-dyeing kit with Procion MX dyes at a local crafts store, but these contain only three bright colors, never a subtle pre-mixed color like gray. You'll probably want to order your Procion dyes by mail. Depending on your location, look at the dye suppliers PRO Chemical & Dye in Massachusetts, or Dharma Trading Company in California. See my list of "Sources for Dyeing Supplies Around the World".